Well first off, let me tell you about the two photos posted. Pam and Werner’s son, Dieter, is a freshman at the University of Montana as a music major. 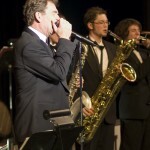 He is a serious musician and has played in jazz bands for years. 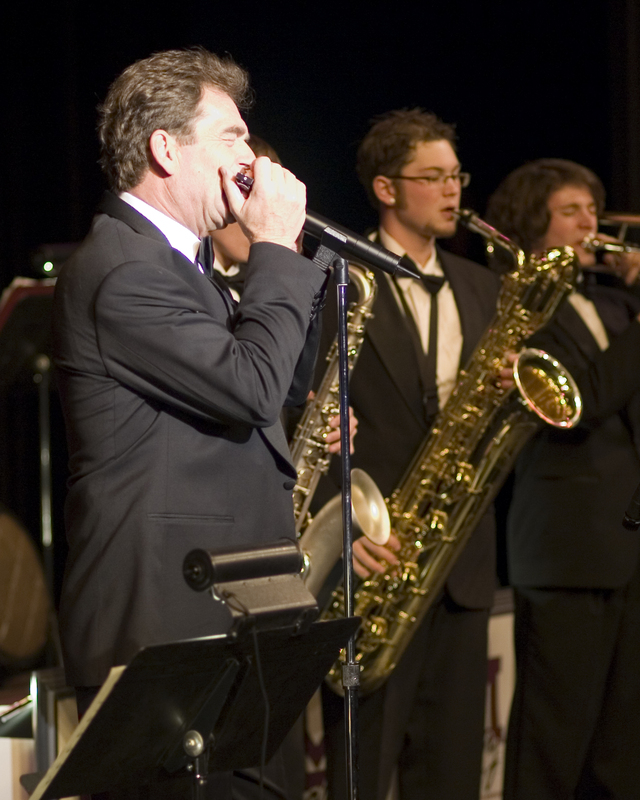 He is in the University of Montana marching band, and he also was the only freshman who made the university jazz band. So we are very proud of him. Anyway, a fundraiser was held for the band. 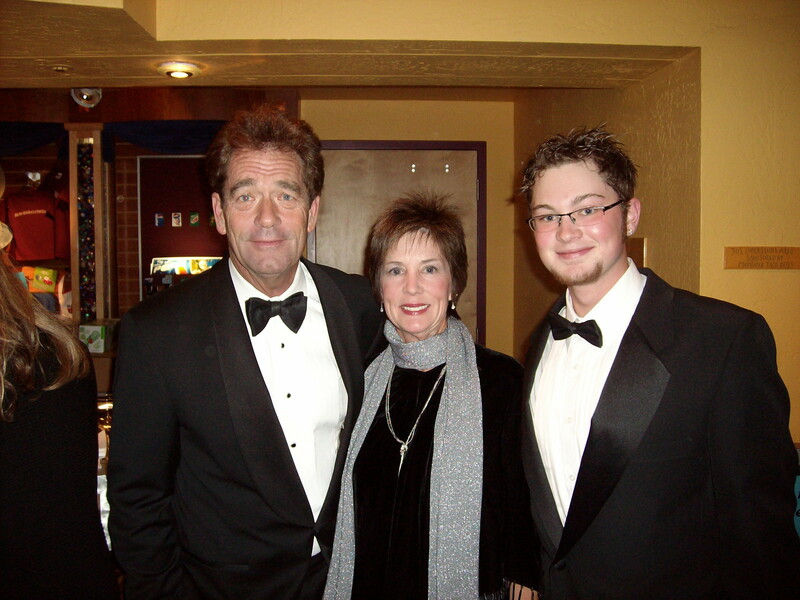 Huey Lewis is a Montana native so he gladly helped out with the fundraiser. As you can see from the photos, Dieter is on stage playing his sax with Huey Lewis playing the harmonica. 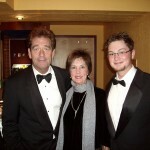 The next photo is Pam, Dieter’s proud Mom, Huey Lewis, and Dieter. Dieter is an Eagle Scout and has many other honors and he is one special young man. 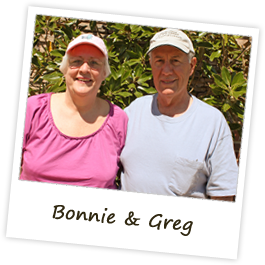 Pam and Werner picked us up Sunday morning and we walked to a nearby restaurant for a wonderful breakfast. They even had grits on the menu, but none of us tried them. After breakfast, we drove over to their cabin which is only 5 miles from the east entrance of Yellowstone. It was a marvelous cabin, very rustic, and they go there in the winter especially to cross country ski. Pam and Werner are the most active people we know. Pam is the president of the bike club in Cody and Werner is on the rescue squad. They have ridden their bikes 50 miles to Yellowstone and back all in one day. They are serious bike and ski advocates. 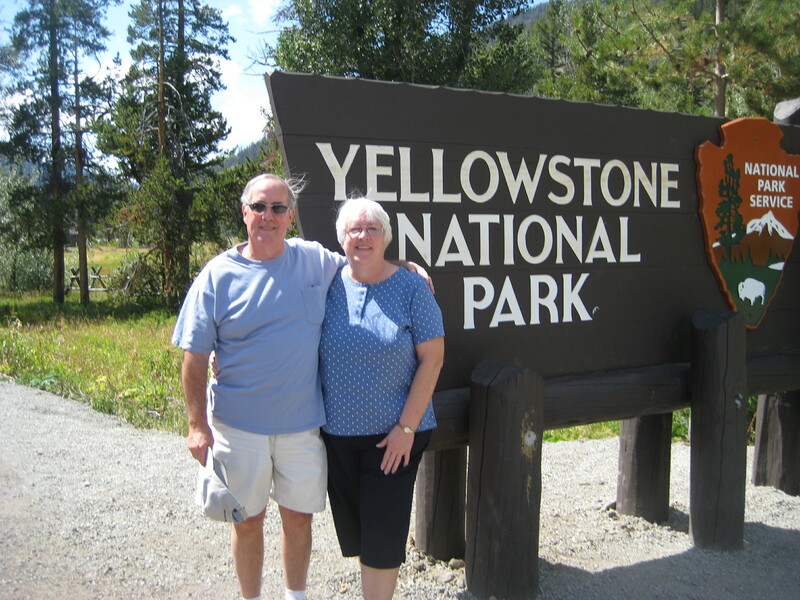 We had lunch at a cafe right at the entrance of Yellowstone and then returned to their home. Well, not really, because Pam took us to the Sierra Club store, a wonderful store with all sorts of clothing, etc. And we stopped by a little store to get an icecream cone (Greg’s favorite). We have laughed out loud all day, because everywhere we go, people know Pam and Werner. Cody is a small town of around 10k, so they know everyone, and everyone knows them. 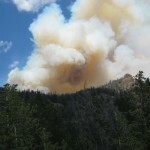 Even in the little store for ice cream, three old guys were sitting on a bench out front with their dog at their feet, and they said “hello Pam, where are the latest fires?” We have a couple of photos of the fires that pop up across the mountains. 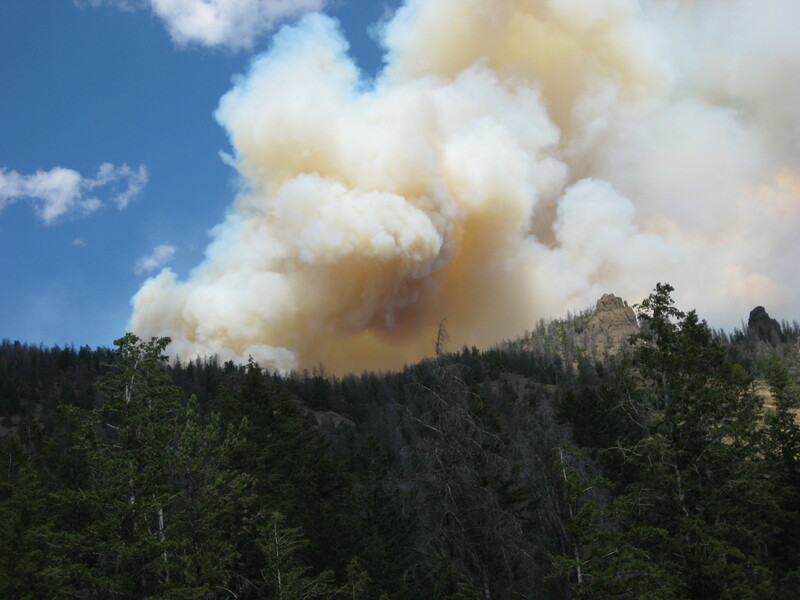 The fires are extremely close to their cabin, so they have actually taken most of the furniture out of it while the fires are raging. This is part of life out here. Fire spotters are parked along the road and everyone out here is vigilant in watching out for their neighbors. We grilled salmon for dinner and enjoyed hearing stories of Pam and Werner’s adventures. 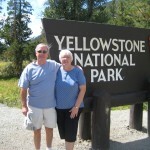 We will go into Yellowstone Park on Monday morning so probably will not have internet access for a while. But I’ll update the website as soon as I can. Stay tuned. Enjoyed the update. Looks like this travel thing could get addictive. Keep having fun and reporting in!! Hope you didn’t get lost in Yellowstone Park this week. I’ve been missing your updates. Just didn’t expect you to be out of pocket this long! Have a wonderful Labor Day Weekend!